Although the Associated Students of the University of Washington are recommending to President Emmert that the school host Seattle's Tent City 3, not everyone is in favor of having the homeless residing on campus. While the debate between students continues to take center-stage, reactions to the proposal by tent city's residents have taken a back-seat to the controversy. Spokesmen for the camp said nearly all of the residents favor the idea. Residents cited different reasons for wanting to come to the UW. Some want better living conditions. Others want to challenge students' thinking, to engage them in a mutual learning environment. Students in favor of tent city residing on campus have gone viral, having created two groups on Facebook to promote their cause. A third Facebook group is campaigning against extending an invitation to the 100 or so homeless people living in tents. The group cites safety concerns in welcoming the homeless to the University of Washington--concerns that many may consider homeless stereotypes. Tent City 3 residents say the characteristics described are not associated with their tent city, most of them relating to drugs, alcohol, and violence. All of which are not tolerated at the camp. Despite these restrictions, students like UW journalism major Katie Paff still object to bringing a tent city to campus. The stigmatism that comes along with homelessness is nothing new to Tent City residents. Long-time resident and camp advisor to the Elected Committee at tent city, Lance Rowland said tent city initially faces opposition everywhere it goes. “We run into the same thing you're witnessing right now, which is the fears, the hatreds, the phobias, the misinformation, the 'not in my neighborhood stuff,'” he said. “It's these stereotypes that are designed to keep us down, keep us in place." Rowland explained that writing stories about homelessness doesn't change stereotypes. It takes engagement and learning. A former senior systems analyst for Physio-Control Corporation, makers of the first battery-operated cardiac defibrillator, Rowland is very articulate. The proposed stay at the UW makes camper Robert “Shady” Gordon feel good. He thinks there are barriers preventing their stay on campus. Barriers founded in stereotypes. E.J. moved to Tent City 3 for safety. He had a spinal infection that left him debilitated. He lives in pain, barely able to walk. On the streets, E.J. says he was stabbed six times and had his jaw broken with brass-knuckles. 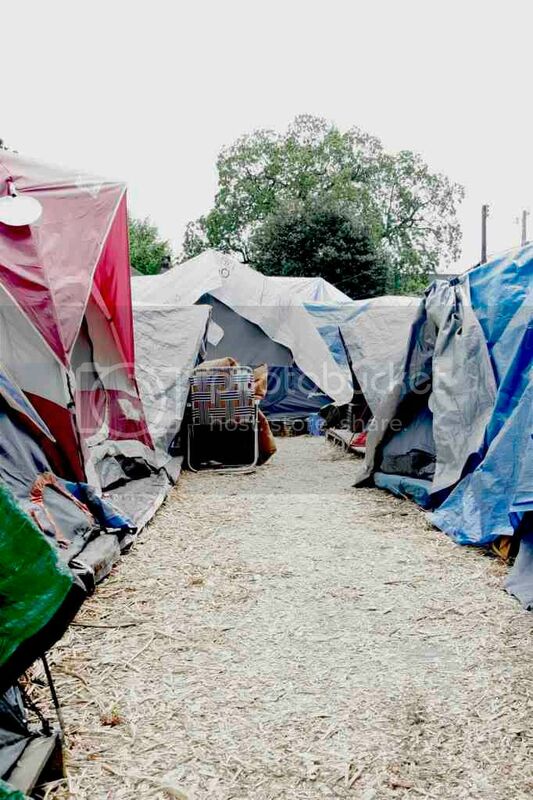 “There are currently 102 people at Tent City 3 and more than half of them work," he said. Residents would like to improve their living conditions and aren't asking much of the university. A little more space, a flat area to camp on, more than one power cord and more than one water hose would be nice, they say. Resident Linda Richards said it's more space that she'd like. Residents see a stay on campus as a way to increase student's awareness about homelessness, as a way to change social attitudes about them. They acknowledge their roles as teachers. “Why is it socially unacceptable for someone to go hungry in this country, but yet it is socially acceptable for someone to be homeless?” asked Rowland. "Reality, not fear, is what changes peoples attitudes." Mostly, residents just want the university to give Tent City 3 a chance to prove the nay-sayers wrong.